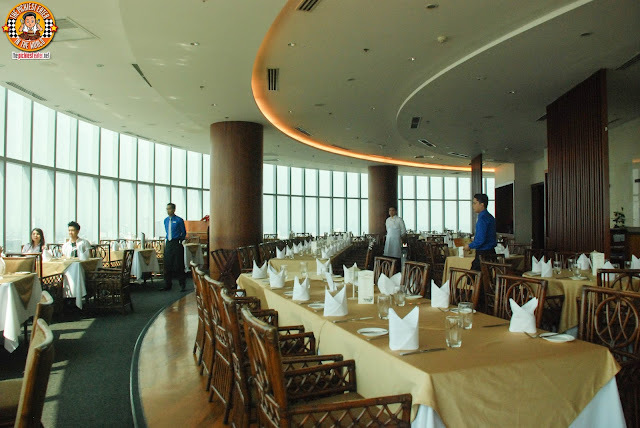 100 Revolving Restaurant is located on the 34th floor of the 100 MDC Tower in Libis, which is pretty much in the heart of the Metro, making it a very accessible location. The classy interiors are complimented by the glass windows that surround the restaurant, making this a very romantic place at any time of the day. However, the charm of 100 Revoling doesn't end there. Apart from the awe-inspiring view, the other highlight of the restaurant is that the outer ring of the restaurant actually does revolve around 360 degrees. 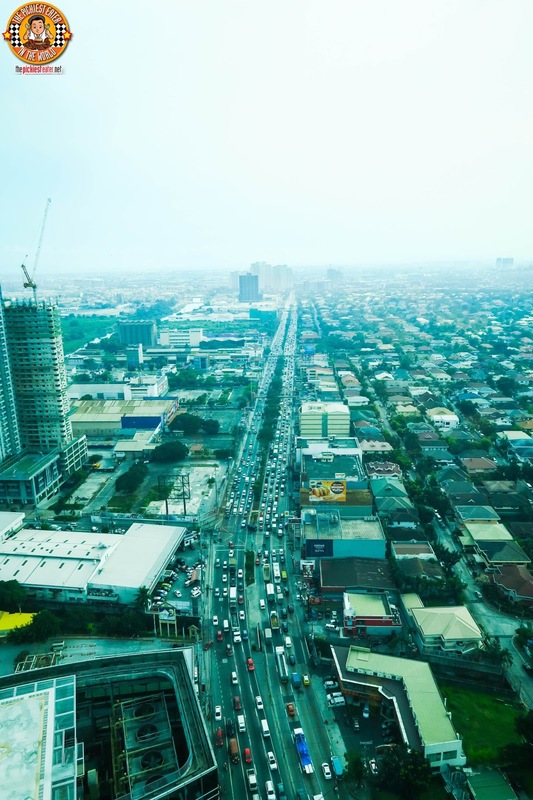 This feature offers customers something that other rooftop restaurants cannot.. A complete view of the metro, without having to leave your seat. And say what you want about Metro Manila, but amidst the Traffic and Pollution, there is something truly romantic about watching the world go by from 34 floors above, without a single care in the world. But the biggest question was.. How is the food? With the acclaimed Chef Jessie Sincioco at the helm, you know you're in for a dining experience of a lifetime. 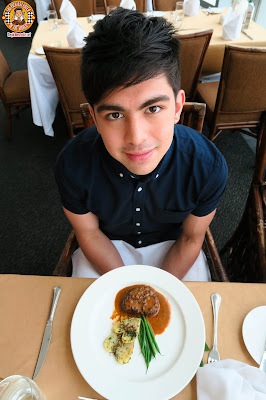 So before it was even released, Chef Jessie let me and the GMA stars sample her Valentine's day Menu! Chef Jessie's finesse and technique was evident from the very first course served to us, which was the Pan Fried Goose Liver in Fleurons. The Goose Liver is masterfully pan fried, then glazed in a mind blowingly delicious Raspberry Honey Glaze, then placed in between a puff pastry heart. 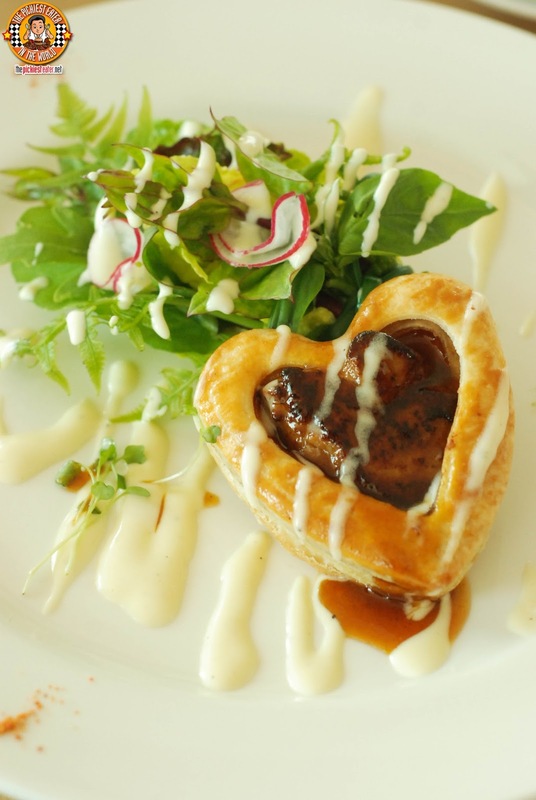 To make the plate even prettier, it is served with a lettuce salad "Bouquet", drizzled in a creamy French Dressing. 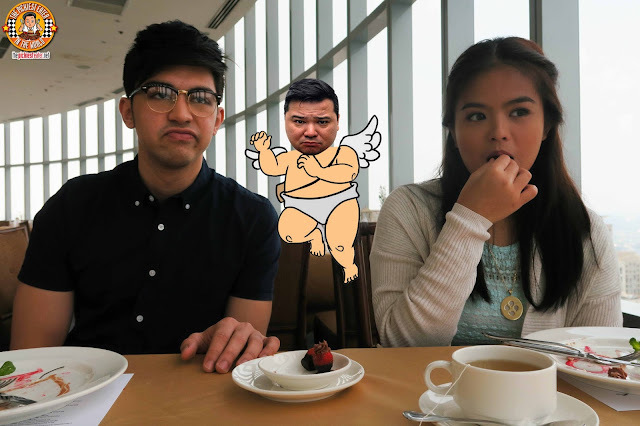 As they feasted on the Goose Liver which they both absolutely LOVED, I noticed with Derrick and Bea is that their chemistry is electric. Derrick knows how to make her laugh, and actually enjoys doing so. All his jokes were super "Benta" with Bea, so I think they have a great foundation moving forward. 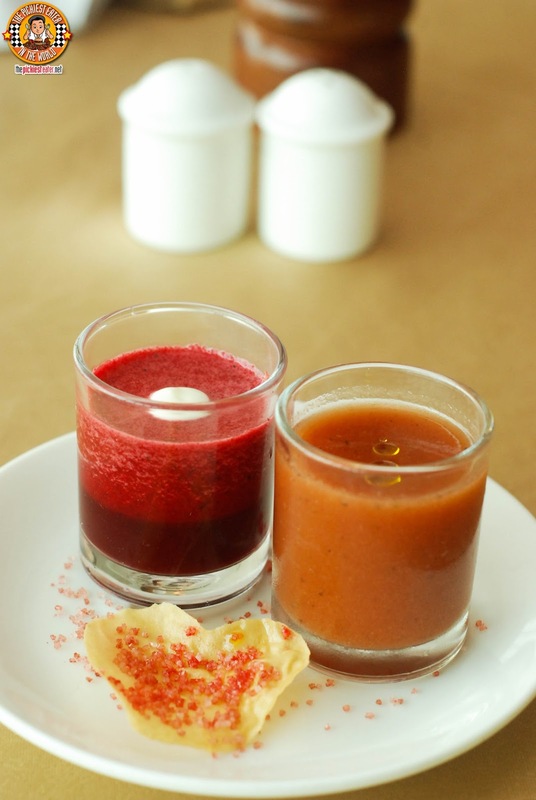 To further get the appetite going, we were served two separate Tomato and Beetroot Gazpacho. I went a little easy on the tomato because of my Hyper Acidity, but I was pleasantly surprised with Beet Root being a whole lot tastier than I thought it would be! Derrick went for the Beet Root, and Bea preferred the Tomato! You could hear the oohs and the ahhs shared between the two as they brought out the Seared Tiger Prawn and Scallop dish. 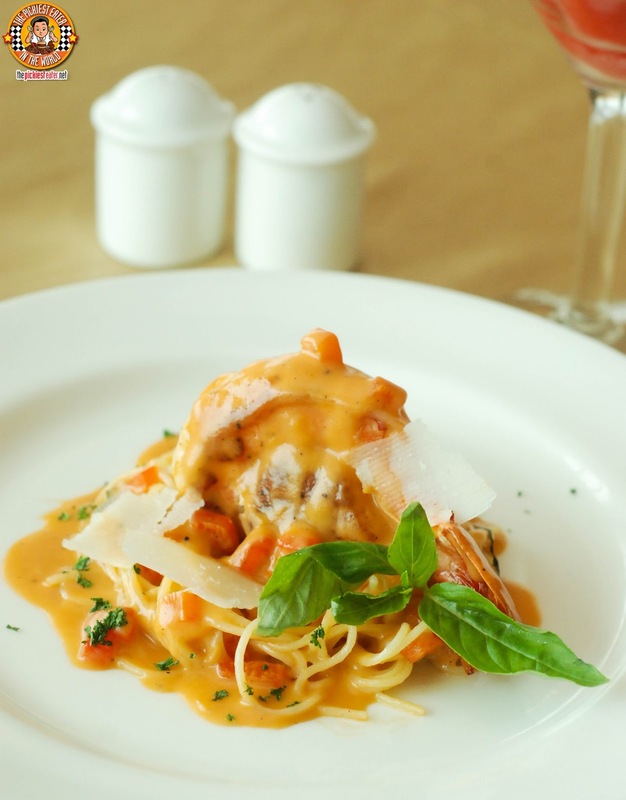 The Seafood was piled on a bed of Angel's Hair Pasta, which was doused in a rich helping of creamy Andalouse sauce. 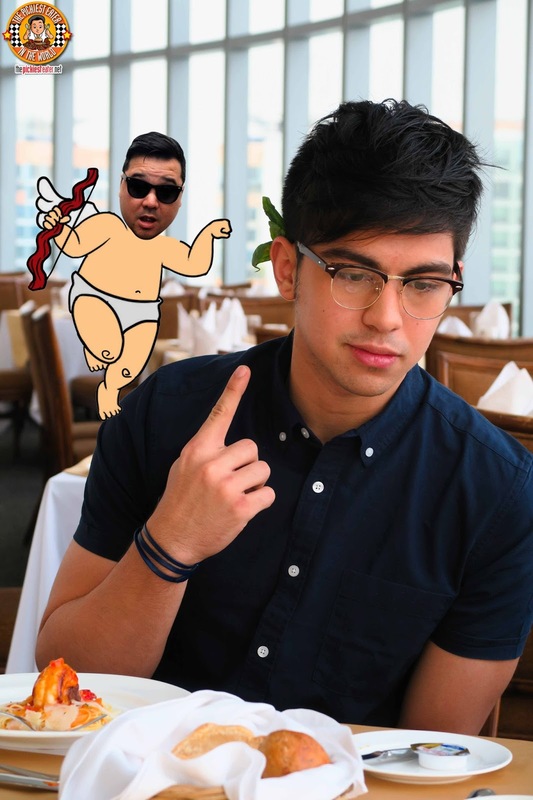 Ever the joker, Derrick couldn't resist turning the leaf garnish into a hair piece.. Much to the delight of Bea, who really has the most adorable laugh! 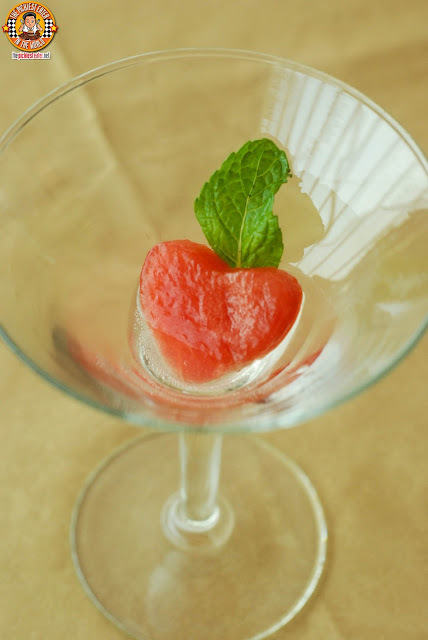 Given that the first batch of dishes had rather robust flavors, Chef Jessie served the palate cleansing Frozen Sweet and Sour Watermelon Hearts next. The Watermelon's innate sweetness was enhanced wonderfully by a bit of Champagne. 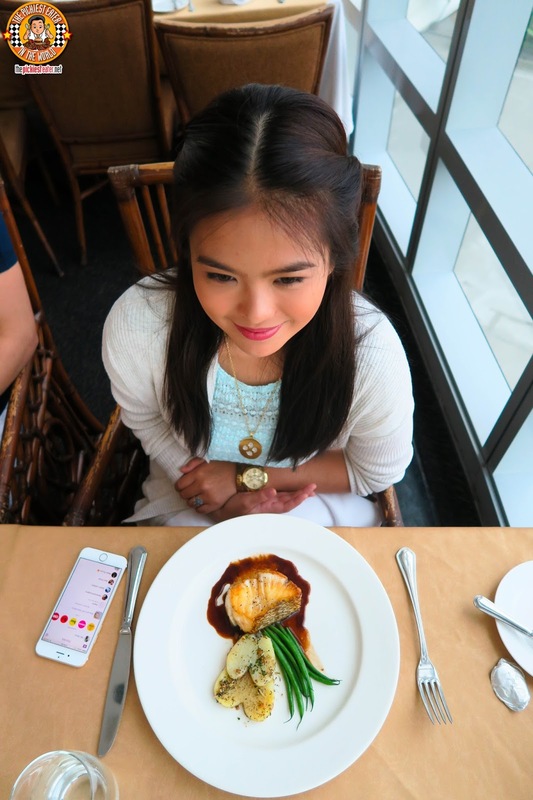 Bea couldn't help but laugh at how she was still working on her Shrimp and Scallop dish, Derrick couldn't wait to gulp down the Watermelon! 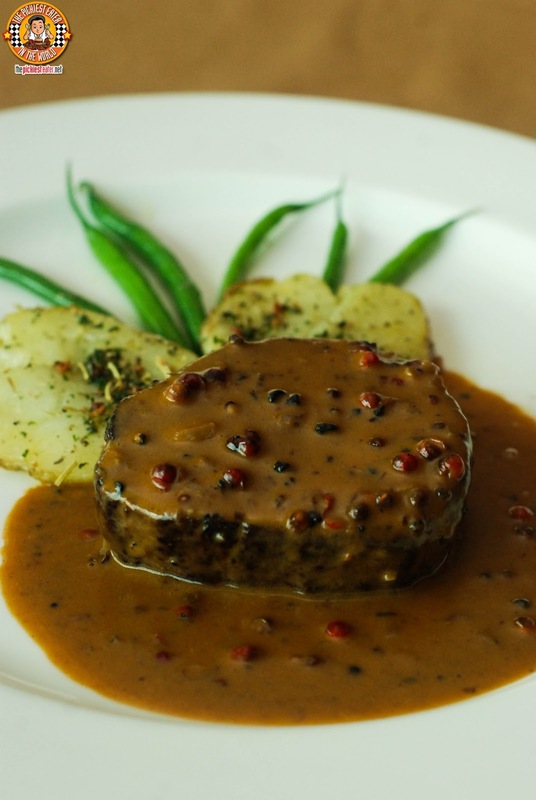 For the Main Course, Derrick order the amazing Grilled U.S. Black Angus Beef Tenderloin Steak, which was swimming in a luscious Smoked Pink Peppercorn Sauce. The meat tore off with the lightest slice of a knife, and virtually melted in your mouth with every bite. The Peppercorn sauce was a phenomenal compliment to the natural flavors of the beef. Bea opted for the Pan Fried Chilean Sea Bass Fillet, which in my humble opinion - and this is despite the excellence of the Tenderloin Steak - was my favorite dish of the day. 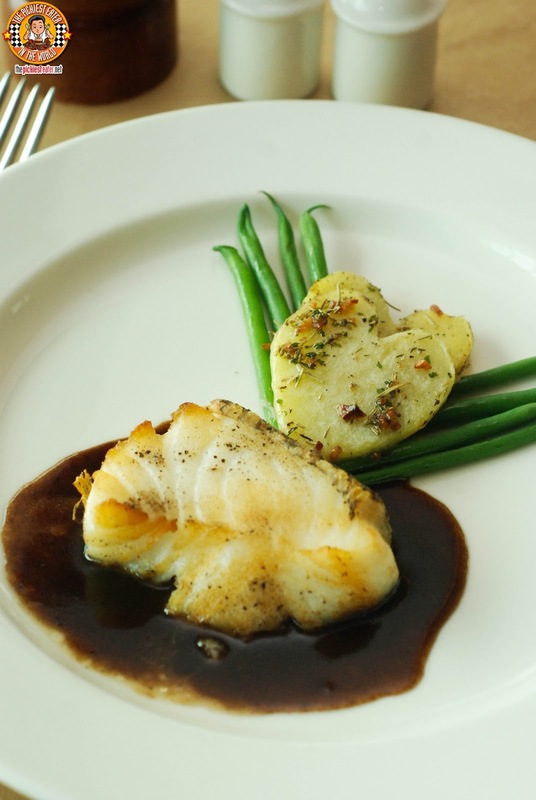 The Beautifully cooked fillet of fish laid in a shallow pool of this Tamarind Balsamic sauce, which offered a wonderful balance of sweet and tart. I honestly love the care taken into each dish to add heart shapes, whether it's the potatoes or the crisps in the soup. 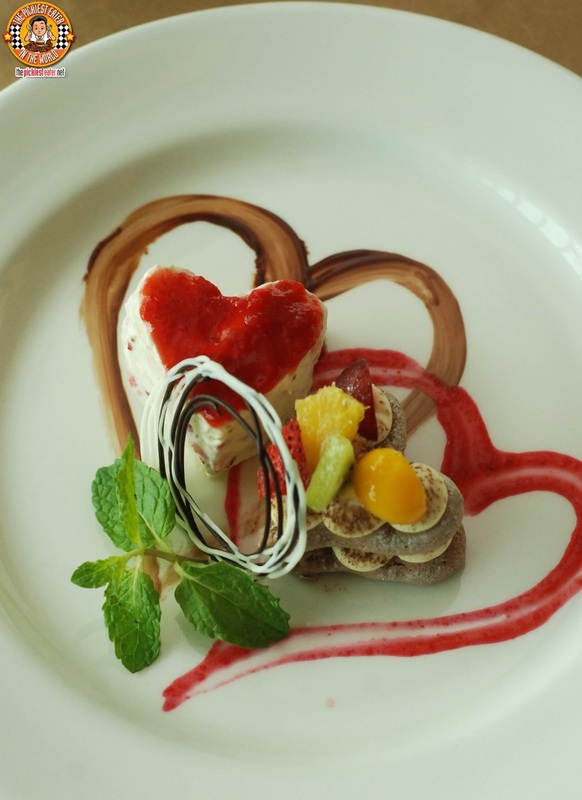 The couple found their dishes almost too pretty to eat.. However once they took a light sniff of it, their tummy began grumbling and they immediately went to work! 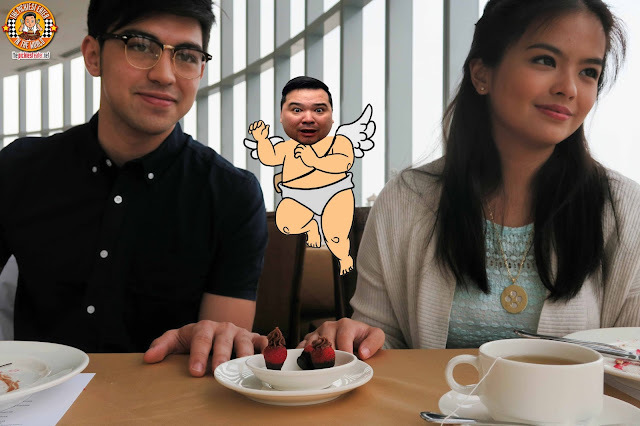 Although Derrick was happily enjoying his steak, Bea's reaction to every bite of her Chilean Sea Bass got him curious. Quite the inisera herself, Bea denied all of Derrick's attempts to get a bite of her fish. 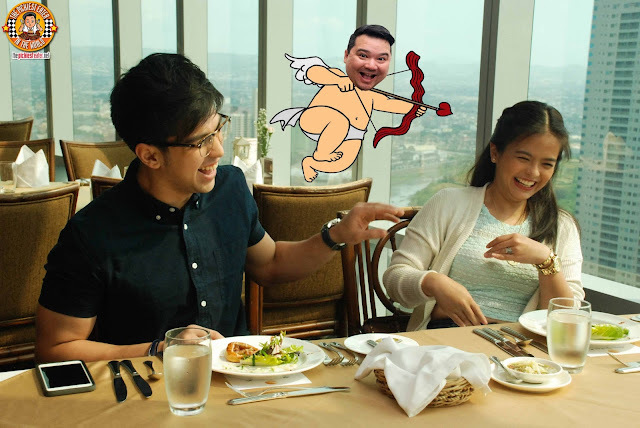 Derrick's fork finally got through when another one of Bea's laughing fits caught her off guard! 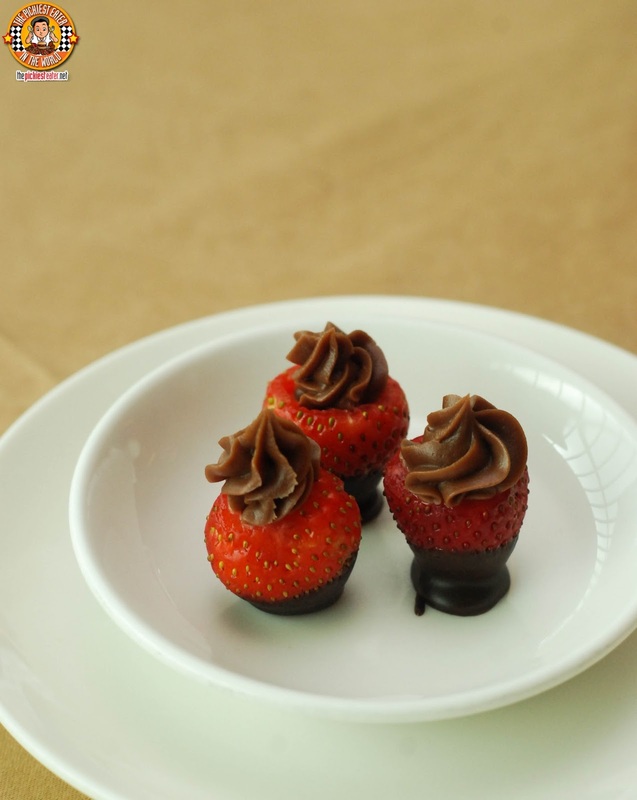 The final touch of the meal were the simple yet delectable Petit Fours, which came in the form of tiny strawberries, topped with Chocolate Ganache and dipped in dark chocolate. Realizing that the meal was coming to an end, Derrick decided it was time to make a move. 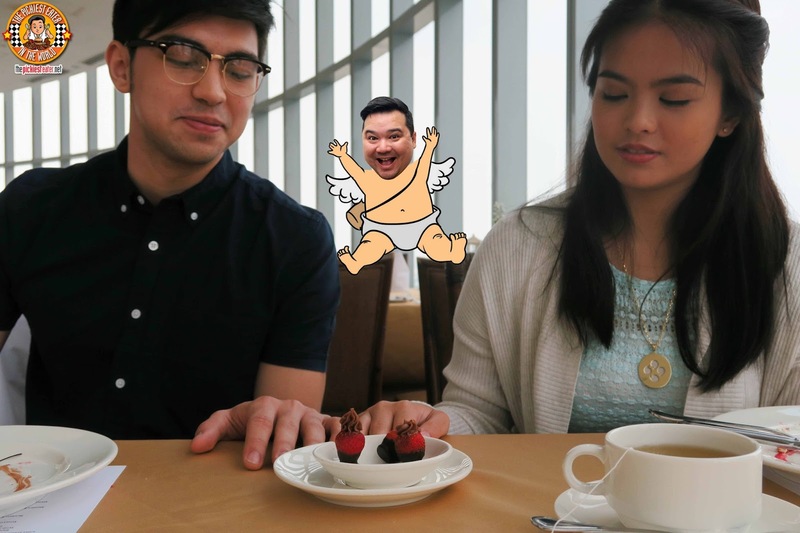 Bea seemed mesmerized by the splendor of the view that 100 Revolving had to offer, seeming to not notice that the Petit Fours were served. Deciding to seize the moment, Derrick slowly moved his hand closer to hers. In what seemed to be a super kilig moment, Bea moved her hand closer to his as well. I couldn't help but think that I was the best cupid EVER! Much to Derrick's dismay, it was apparently only because she wanted to pick up a strawberry, leaving Derrick having to try again another day! 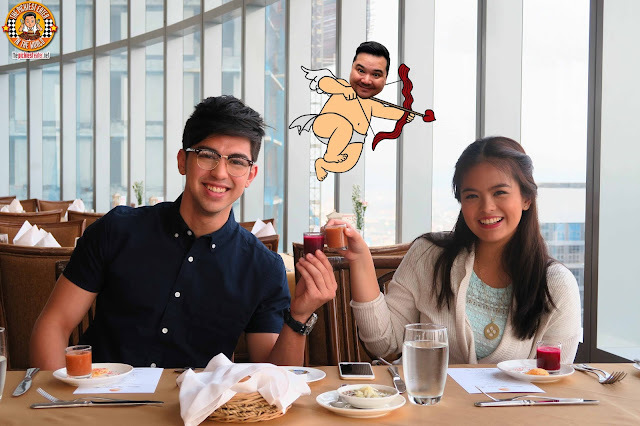 On the whole, Bea seemed to truly enjoy the effort Derrick made to ensure she had a good time. 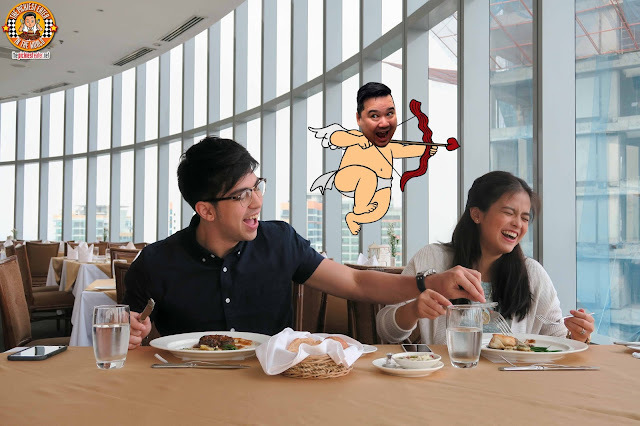 Chef Jessie's pulled out all stops with her Valentine's Day Menu (P3,000++ Per Person), and the couple left the 100 Revolving Restaurant, more than satisfied! 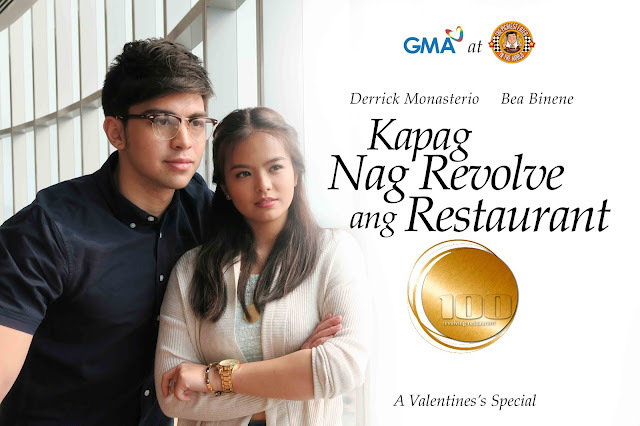 Derrick and Bea's stardom is poised to explode to new heights when their latest Teleserye, "Hanggang Makita Kang Muli", premieres on February 22, during the GMA Afternoon Prime Block. I'm confident that Derrick and Bea's love team is going to take the country by storm. Their chemistry together is undeniable, and their friendship makes it easy for something more to blossom! 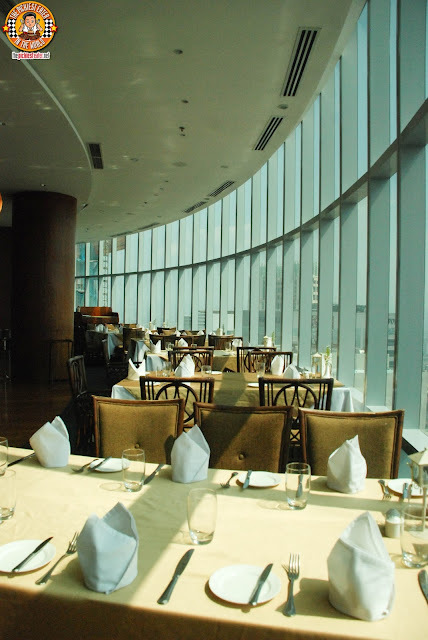 Like 100 Revolving Restaurant on Facebook!